What is a MAGNETIC RECONNECTION in the Magnetosphere? Charged particles or plasma makes up about 99% of the universe. Magnetic reconnection involves how this plasma interacts with magnetic fields such as in Earth’s magnetosphere. This has implications for air traffic control, GPS signals and communication satellites. For example, massive solar flares created a geomagnetic storm in 2003 and was felt in most of North America. Scientists are still trying to unravel the mysteries of magnetic reconnection. Here’s some basics how it works. Plasma makes up a large portion of the universe. From coronal mass ejections (CME), the sun releases vast amounts of plasma or charged particles. When plasma enters the magnetosphere in normal conditions, Earth’s magnetic field lines are relatively unaffected. But sometimes, the plasma released from the sun can break apart Earth’s magnetic field. This forces Earth’s magnetic field to realign into a different pattern. 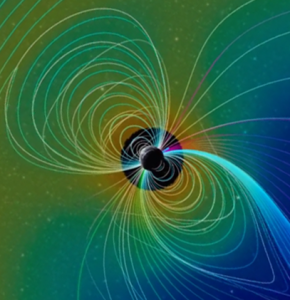 This magnetic reconnection can blast a tremendous amount of kinetic energy and heat impacting space weather and communication systems on Earth. Orbiting in the magnetosphere, NASA’s Magnetospheric Multiscale (MMS) Mission tries to capture magnetic reconnection live as it happens. Instead of looking from the outside, MMS will measure magnetic reconnection from a 4 satellites tetrahedral formation as it occurs. Specifically, each satellite will measure the magnetic field and movement of particles during a magnetic reconnection. The intention is to better understand what triggers particle acceleration and predict space weather patterns from magnetic reconnection.